The collection features appearances by Thomas Mapfumo on drums and vocals. Whilst playing with HCR Mapfumo began to explore the traditional music of his Shona people and adapted this to modern rock instrumentation, transcribing the scale of the mbira (or thumb piano) to electric guitar with HCR guitarist Joshua Hlomayi Dube. was awarded the German Record Critics’ Prize in the category ‘Black music’. This victory was all the sweeter for its triumph over the predicted winner, Aloe Blacc ́s multi platinium record, ‘Good Things’. An exceptional set of circumstances existed in the history of Angola before Independence that created the giant leap in the style and standard of bands and recordings of the time.When Portuguese repressive measures prevented the small Turmas, street musician groups, from being able to perform in Carnaval celebrations in 1961, a Portuguese civil servant, entrepreneur and Angolan music fan named Luis Montês was already in a position to capitalise on Luanda’s need for a live music scene. His self- designed ‘Kutonocas’, Sunday afternoon live music festivals, delighted a Luandan population hungry for a communication between the city and musseques (townships). It also forced groups to adapt to a different style of playing that would accommodate large stages and broader audiences. 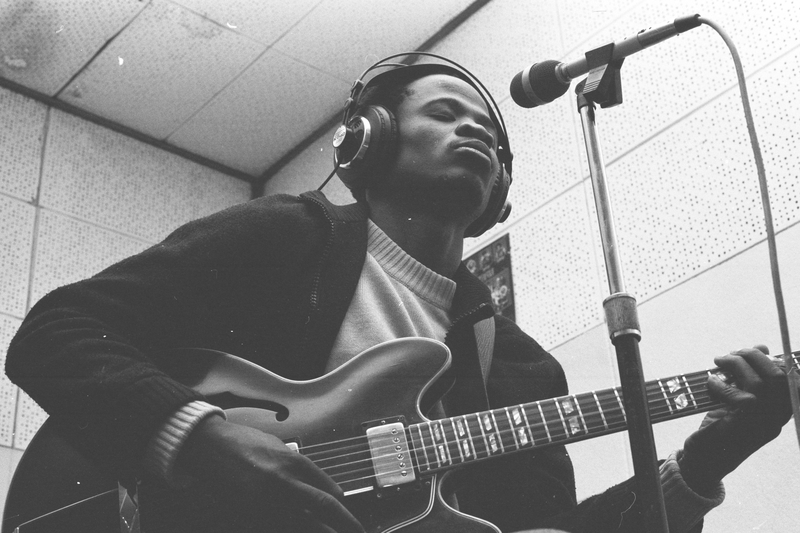 They equipped themselves with electric guitars, and fed on the musical influences from Cape Verde, Congo and the Dominican Republic, while staying patriotically true to their own musical legacy and unique rhythms. KGWANYAPE BANDFounded in 1985 by the late Duncan Senyatso (singer and guitarist), his brother Caxton (bassist) and the Scottish musician Simon Jaquet, the Kwanyape Band were the guardians of a culture of multiple components, which they vivified through personal research, without giving in to the pressures of a material world. 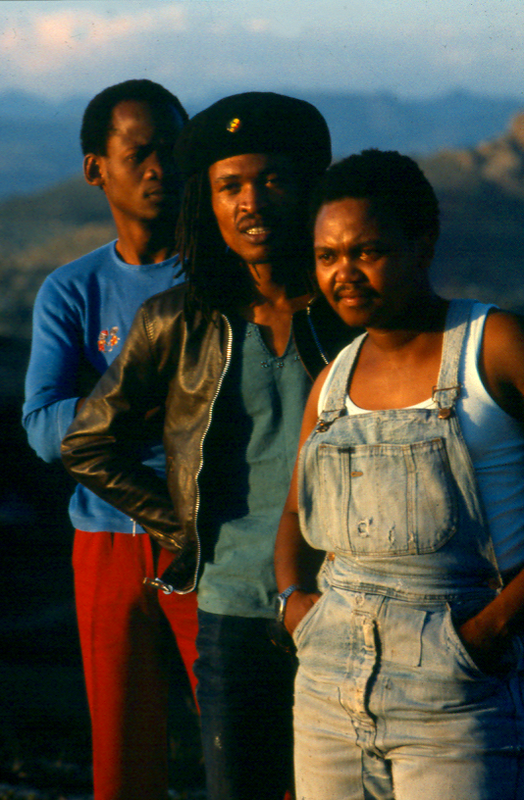 This philosophy made them one of Botswana’s most popular bands at that time.The group’s composition reflects a desire for openness and adventure. On the mandolin Simon Jaquet brings a particularly Celtic resonance. Misja Carbo, from Holland, explores the resources of the electric guitar. Both of them, before returning to their home countries had worked for a few years in Botswana, where the other members of the group come from.Between future and tradition, sky and earth, the Kgwanyape Band mix luxurious horizons, in order to give birth to a universal culture that answers to Botswana’s reality. This album testifies to the vitality of a band who toured ceaselessly in Botswana where they supported famous names such as UB40, Eric Clapton or Paul Simon.Duncan died of stroke at Princess Marina Hospital on April 26_2006. In 1972 he recorded with the Boyoyo Boys, a big jive band at the time. He worked with the legendary producer West Nkosi on sessions like ‘2 Mabone’ which went gold twice for the FGB label. These ‘Mabone’ records were a bit of a craze among jive musicians. Mabone means headlight and the number describes the number of headlights on a car. There were loads of Mabone titles ‘3 Mabone’, ‘4 Mabone’ etc.But jive music had not made much progress since it originated and consequently the newer sounding disco took over as a popular form in the mid-70’s. Jive as a music form was put into the shade by disco for some time, but Noise remained optimistic about its survival. Noise has never made disco records, he went back to the traditional music and also marabi, an early jive guitar picking style, where the instrumentation is guitar picking and rhythm guitar, plus occasional addition of saxophone, but no drums or bass guitar. In 1989 Noise had recorded with Mahlatini, the renowned groaner, and he made a special appearance as member of the Jo’burg City Stars’ that same year. 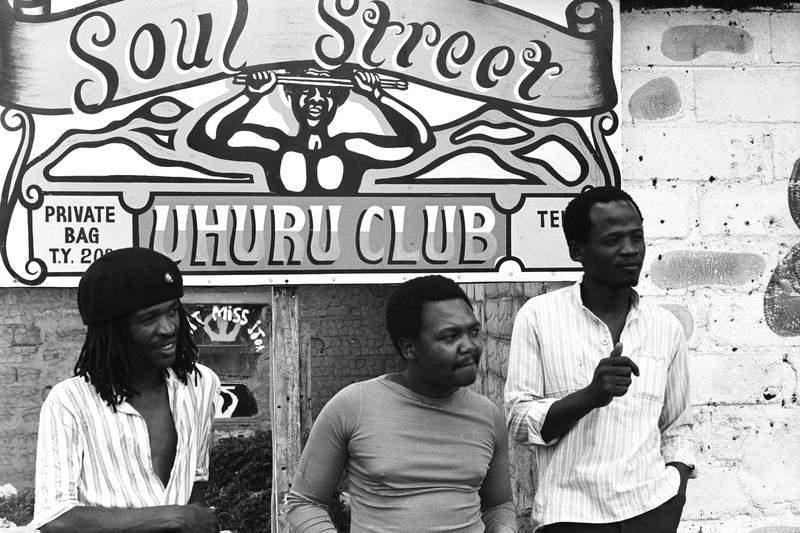 Junction Avenue Theatre CompanySophiatown was the ‘Chicago of South Africa’, a vibrant community that produced not only gangsters and shebeen queens but leading journalists, writers, musicians and politicians, and gave urban African culture its rhythm and style. This play, based on the life history of Sophiatown, opened at the Market Theatre in Johannesburg in February 1986 to great acclaim. The play won the AA Life Vita Award for Playwright of the Year 1985/86. Ironically, the first full Shifty project was not a punk or new wave band at all, but Sankomota , recorded in Lesotho in late 1983. I had heard them whilst working on a documentary in Lesotho earlier that year. At that stage the band was a three piece, but they had previously toured South Africa with a larger outfit under the name Uhuru. Because of their lyric content, their name and the provocative onstage outbursts of a band member who went by the name of Black Jesus, Sankomoto were thrown out of the country.They were now in a pretty dire situation for a band wanting to record. There were no studios in Lesotho, which was and is the only country in the world completely surrounded by another country – in this case South Africa, where they were forbidden entry. They were of course too broke to fly elsewhere. This is when I discovered the benefits of owning a mobile studio. I parked the caravan outside the recently deserted studios of Radio Lesotho, ran a cable inside to one of the rooms and we were in business. Frank LeepaRecording Sankomota taught me a lot about producing music and working with artists, but I also learned painful lessons about the recording industry in South Africa at large. We had made what was patently a good album; it’s subsequent track record and critical acclaim confirms that. But no record company was willing to release it. The music did not conveniently fit into any of the industry’s pigeonholes, and no one could see past that. This bias against original, or edgy music was reinforced by the broadcast media with their safe and restrictive play lists. Sankomota failed a number of tests in this regard. Firstly, they sang in different languages, which violated grand apartheid’s pipedream of keeping all languages pure and separate. Secondly, the lyrics referred to what was really happening in the country, which was of course a total no-no. And finally, the music was eclectic, a concept that has confused industry marketing departments since the invention of the gramophone. These experiences were to repeat themselves with almost every record that I produced over the next decade. But I was young and naïve at the time, so I decided to set up my own record company and do what nobody else was willing to do. Thus Shifty Records was born. At a time when the youth of Britian were rediscovering the fun and liveliness of 60′s Jamaican Ska, and bands like Madness and the Specials were riding a wave of popularity, the Genuines decided to do a re-introduce early “Goema” music of the Cape to a younger audience. Largely ignored and undiscovered this album has to rate as one of the finest South African fusion albums ever. Listen in full fidelity to tracks from this album. Digitally remastered and available for download for the first time ever in Flac or high quality MP3 formats. Samuel “Mr Mac” McKenzie (1924-1990) played banjo for over 50 years and was one of the last wave of the true exponents of “Goema” music of the people of Cape Town. The Federation of South African Trade Unions (FOSATU) was the first South African trade union federation that organised mostly Black employees that aimed to be a national, non-racial umbrella organisation that could coordinate Black trade union movements. It came into being after the South African Congress of Trade Unions (SACTU) and Federation of Free African Trade Unions (FFATU) disintegrated in the 1960’s. It had 12 partners representing 45 000 workers. The organisation aimed to ensure that its partners were democratic and that leaders were elected from the working class. This approach encouraged the development of properly organised, democratic trade union movement in South Africa. FOSATU remained removed from affiliation with political parties, unlike SACTU, who joined forces with the African National Congress (ANC) and the FFATU, who aligned themselves with the Pan-Africanist Party (PAC). RECORDING THE FOSATU WORKER CHOIRS -Lloyd Ross“In the mid Eighties, at a time when the unions weren’t really centre stage, I had been filming the resistance that was building against apartheid for my outfit Video New Services. My friend Lloyd Ross was wanting to find vital music outside the mainstream and what was obvious in my line of work was that wherever resistance occurred there was song. At a rally we had seen a trade union choir and I raised the idea with organisers in FOSATU that we make recordings of some of their affiliate’s choirs. They were surprised, but thought what the hell, why not?“Soon we were on the road to meet a choir in Brits at a community hall. They sang some resistance songs and some that felt like disco. We found that this type of eclecticism was not uncommon as, together with Fosatu organisers, we set up trips to shop floors on the east Rand, then on to Natal, recording in Mooi River, Durban and Maritzburg. On the whole, the songs were a mixture of church rhythms and worker aspiration. Of the large body of songs that were recorded, only the more political made it onto the Fosatu Worker Choir compilation. It was a small idea at a time when no one else was doing anything like this”.